With this recipe, we already have our pizza dough proofed and ready to use. Our sauce has been made. So now is the time to assemble our pizza. 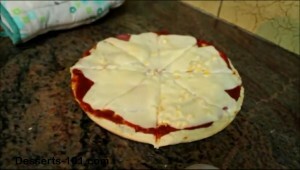 There will be a few different options on how to assemble and bake the pizzas. One is using a pizza pan and the other is directly on a pizza stone. We start with our proofed dough, turning it out onto a floured surface. 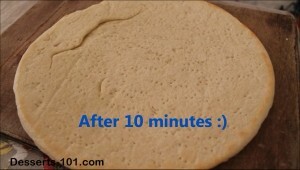 Divide the dough into 2 pieces, shaping them into round disks which get covered and rest for 10 minutes. Proofed Dough turned out of bowl. Dividing the dough into two. A quick knead to get the dough into a ball. Let it rest 10 minutes before making into a pizza round. Now we use out hands to form the round disc, toss and use a rolling pin as needed. I like to first work the dough round into a disk and work out with my hands. Then I try my skills at tossing the dough in the air. This takes practice. Notice I am using the knuckles of a closed fist to hand the dough. I even use a rolling pin to help shape it. Then I place it in a pizza pan and dock th dough. 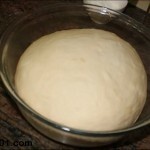 Place the dough into a pizza pan, dock it and bake in a 400ºF/205ºC oven for 10 minutes. (I know the first picture shows a par-baked crust, but I wanted to show the docking here. The second picture is showing the pan I use and a par-baked crust. Notice just light color on my crust. 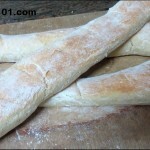 Check out how I docked the dough with a fork. No need for a fancy dough docker. Finished pizza crust. I took this picture to show the pan I use. Spread with sauce, add topping and then bake at 400ºF/205ºC oven for 10 minutes or until done. 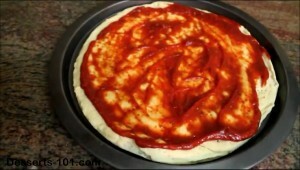 Adding Sauce to the par-baked crust. The sauce has been spread out. I add some topping to the dough. Yes I like corn on my pizza. And some pepperoni. Then I topped it with cheese. 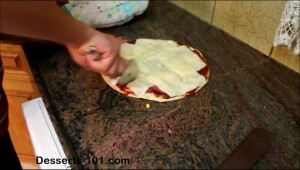 Remove pizza from the oven and remove from pan to a cutting surface. Allow to cool several minutes before slicing into the desired number of pieces using a large wheel cutter. Finished pizza, I can not wait to slice it. Cheese - traditional is a mixture of mozzarella and provolone, but you can use any kind of cheese you want. Turn your dough out onto a floured surface. Divide it into 2 pieces and set one piece aside for now. Sprinkle some flour on the work surface and work the disk with your hands out into a larger round. Continues working with your hands, tossing in the air and/or using a rolling pin to make the disk large enough to put into your pan. 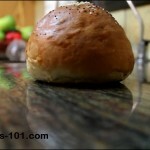 Before you place the dough into the pan, dock it with a fork to help prevent bubbles from forming. Par-bake the disk in a preheated over at 400ºF/205ºC for about 10 minutes. You should see at the most very light browning around the edges, and the center part should be without color. When the pizza crust has baked, remove from the oven to the work surface. Spread half of your sauce (or the amount you desire) to within 1-inch (2-1/2 cm) of the edge. Add toppings and cheese next. Bake the Pizza at 400ºF/205ºC for about 10 minutes until the edges lightly brown and if desired the cheese is bubbly and has a little color if desired. Remove from oven, transfer to a cutting board, allow to cool for a minute or two before slicing. Preheat the oven to 500ºF/260ºC at least 20 minutes before baking your pizza. 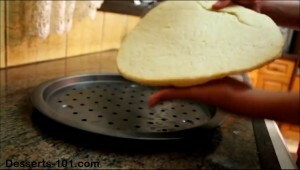 Sprinkle some flour or corn meal on a pizza peel, Transfer your pizza disk onto the peel. Give the peel a shake to make sure the pizza slides If it does not slide, lift the edge sticking and sprinkle some more flour/corn meal. Add toppings and cheese next. Don't overdue the toppings because you do not want the cheese to run off the sides onto the stone. It will create a big mess that will have to be cleaned up when the oven is cooled. Now that your pizza has been created, Give the peel a back and forth jerking motion to see if the pizza slide, if it does not slide, sprinkle a little flour/cornmeal under the section sticking. Transfer the pizza to the oven and place on the baking/pizza stone in a 500ºF/260ºC oven and bake for 8-10 minutes or until the pizza crust is done to your liking and the cheese is bubbly and as a little color in it. Remove from the oven and transfer to a wooden cutting board. 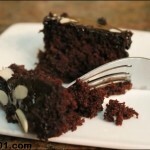 Allow to sit 1-2 minutes before cutting into desired number of pieces.